How adding friction early in the customer experience can get customers to invest in the relationship. The keys to making an excellent introduction. A close look at how you can tap into the feedback loop that gets customers engaged. Why every industry needs to worry about disruption. This week we’re looking at Nir Eyal’s piece, “This is Your Brain On Boarding: How to Turn Visitors Into Users.” Nir looks at how you can build an onramp to using your product or service, which can serve as the foundation for creating strong user habits. The four-step process—trigger, action, reward, and investment—is a great way to get users habitually working with you. The right kind of friction is key to this loop, and Nir dives into it more in his book, Hooked. Joey: Get ready for another episode of the Experience This! Show. Dan: Join us as we discuss the proper way to create a remarkable experience when making an introduction the four step process to hook your customers and how adding friction early in the relationship might actually create long-term customers. Joey: Introing, hooking and frictioning, oh my! We love telling stories and sharing key insights you can implement or avoid based on our experiences. Can you believe that this just happened? Allow me to make some introductions. Frank meet Sally Smith. Sally has been my go to person on the inside at Acme Corp for many years. She's been with the company for 11 years and counting and is a pro at getting you the best package and the best pricing for your investment. I'm sure she'll take great care of you as you search for widgets. You can learn more about Sally here, LinkedIn profile link, and her business here, company website link. Sally meet Frank Foster. Frank is a great friend and a fantastic entrepreneur. He's interested in switching widget providers looking for a great experience at a great price. I told him that I had a friend who could help him out and he's eager to connect. You can learn more about Frank here, LinkedIn profile link, and his business here, company website link. In terms of next steps, I'll leave it to you two to take it from here. For clarity sake, Sally is getting ready to head out for a week of business travel with minimal time to be on email so she's pretty busy. She'll return next Monday so Frank don't expect to hear back from her before that, but rest assured she will be in touch. Please let me know if you need anything else for me. Otherwise, I hope you two enjoy connecting. All the best, Joey. All right. So, why did I read you that introduction? The reason I share this introduction is because this segment is all about the experience and creating a remarkable experience when properly making in an introduction between two people. I got to admit in the last two weeks, I have received five what I like to think of as single opt in introductions. That's where an email appeared in my inbox from someone introducing another person to me and I had no idea that this introduction was coming. I had no idea who the other person was. I had no idea what I was supposed to do with, this new information and this new potential relationship, and the ball had been dropped in my court. I am a big proponent and a big believer in the double opt in intro. With the double opt in intro, you ask both parties independently not in front of each other if they feel that they would enjoy being connected and if and only if they both say yes, then you make the introduction. We can talk a little bit more about how to make that introduction and that's one of the goals of this segment is to give you some clear steps of how to make a proper double opt in introduction, but Dan, what do you think of the single opt in introduction and the double opt in introduction? Dan: Well, what I love about your example is that it was an email but it could be in any other channel as well. I actually started thinking that recently there's been a lot of debate at least among my type of the fact that social media contains two words, the social part and the media part. This really reminds me of the social part is that when we want to introduce people to each other, we have to remember they're both humans. They both have LinkedIn profiles. They both have different backgrounds. What I really liked about your reading of what was clearly a made for podcast example was that you kind of treated them both equally and you shared both of their LinkedIn links and both of their company links. You put them on equal footing with each other. Knowing now that you had spoken with both of them and if they wanted to be introduced, I think that was a real smooth introduction and probably something that led to them eventually contacting each other should they actually have been real people. Joey: Right. So, in the interest of full disclosure, Dan is correct. This is a hypothetical introduction between two hypothetical people, but I will tell you the framework that I used for the email that I just explained. If you're a friend of mine that's ever been introduced to another friend or colleague of mine, you have received an email similar to this. What I've done is over the years and I have learned from many folks who are world-class connectors, people that are great at doing introductions and helping you to build your network, and all of them universally do the double opt in intro. As a result, not only have I adopted that in my own life, but I've identified a six step framework that I think will allow you to not only make proper introductions but to make introductions that really go somewhere as opposed to sitting in an email and leaving both parties feeling awkward about what they're supposed to do next. So, first and foremost in the six step framework is to check with both parties first. Why? Let's check in on their interest level. Let's see if they feel like this would be a good connection or a good person to get to know. Let's also check in on the timing. Part of the reason I'm ranting a little bit on this right now is I've been in the period with a project that I'm working on where for the last two weeks it's been insane. I mean absolutely insane in terms of the amount of work I'm doing, the lack of sleep I'm getting and I have five of these intros pop into my inbox. Now these are intros that had somebody reached out to me beforehand I would've said … well to be frank for three of them I would've said, "I don't think there's a need for an intro. I don't think it's a good fit." For the other two, I would've said, "Yeah, that sounds interesting. I'm happy to have the intro, but can you wait a week or two until this project's done because I'll be a lot more clearheaded and able to respond at that time." So, number one, check with both parties first. Number two, do an email that connects them. The reason I like an email intro is it allows you to put all the information down in writing and to really explain who the person is and why you, the introducer, feels that the two people that are being connected need to connect. Number three and this one's a little bit old school for those of you that may have read Emily Post or Miss Manners, you want to introduce the junior person to the senior person. So, the way you set this up is in this scenario where I start out Frank meet Sally Smith. Frank is actually the senior person and so I am introducing Sally who is the junior person to Frank. Most people won't even notice this. Most people won't even pay attention but those that do have an understanding of etiquette and the proper way to do these things, will not only notice but they will appreciate the additional deference. So, those are the first three of the six step framework for making a proper introduction. Dan, everything makes sense to you? What do you like? What do you dislike? Dan: I think it's great and I have been the recipient of some of these double opt in intros and also I try to send them as well. I think what is nice about it and what I was trying to get at maybe before when I mentioned social media was, this interconnectedness is something that everybody craves these days. No matter how you're introducing people or what channel you're using to introduce them, networking is something that we all do and we all get benefit from. Yeah, sometimes the double opt in to the senior person so that the senior person can help out the junior person for example. I've certainly been asked in a number of occasions, "Hey, would you talk to this person? She just got out of college or he just got out of college etc." Then there's other times where you're on the flip side of that and it's like, "Hey, someone's going to do you a favor and introduce you to somebody that might be able to help you out." So, I really like the kind of pay it forward aspect of it. I think that if everybody follows Joey's steps and I know there are three more coming, I think that what you'll see is that you will receive as well as give more introductions and that obviously helps with everybody's network. Joey: That's definitely the goal because I'm a big believer that it's not what you know, it's who you know. We should always be thinking about how can we expand our network but also how can we provide value to our network. One of the best ways you can provide value to your current network is to introduce them to other people in your network that they might have some points of commonality or some opportunities to do business or even just similar interest and likes that they can build on. So, continuing our top tips for the double opt in intro. Number four, take the time to tell each person about the other person not only in the original communication when you reach out to see if it's okay to do in intro but then reiterate that in the actual introduction email. The reason being is there may be a gap between when you first tell them you want to make this introduction or when you actually do and we want to continue to provide context. Number five, include a link to their LinkedIn profile or their website of their company or both. You want to make this as easy as possible for the person who is looking for different things they can connect on and looking to see what the motivations and the interest might actually be to read up a little bit more on this person from within the email that you sent. Connecting to a LinkedIn profile or something like that is an effective way to make it easy for the people you're introducing to learn more about each other. Number six, leave them to continue the conversation. Set it up. You may want to explain a little bit what's going on in their lives and give a context for when they might be following up, but leave it to them and kind of get out of it. The whole point is to make the proper introduction and move on. As long as we're at it, one pro tip, use a service like Contactually to pre-write intros and/or save your intros. What you'll find is the more you start to make introducing people a part of your own networking and your own relationship management, you will find yourself introducing friends to different people where you're introducing the same friend again and again. A service like Contactually is a software product that rides and allows you to enter in some notes so that when you do make that introduction the notes are already pre-populated. So, take advantage of the tools that will make your intros more effective, more efficient and more experiential. Dan: So, Joey, I have a question and then I want to add in a tip of my own. The question is, should you specify who the person is that is going to follow up or should you quite literally as you said just leave them to continue the conversation and kind of see who speaks up next? Joey: I think it depends on the situation and the scenario. In the example that I read, I kind of hinted about Sally being the one to follow up because in that dynamic it was a situation where Sally was the junior person and Sally was the salesperson. So, what I was basically trying to say is, "Look, I'm going to make the salesperson chase a little for this business introduction I'm making." I think that's something that you can check out with the people when you're doing your original ask of would they be interested in an introduction and then depending on what they say, go ahead and set that. I personally like to do that to set a little bit of context about "Well, it will be useful if so-and-so follows up first, but I'll leave it to you to decide." If it's too equal, people of kind of equal footing and it's more just you should know each other because you both get some value from the introduction, then I'll leave it to them and say, "Hey, I know you both well enough to know that you're going to be fighting to connect first. So, have at it and let me know how it goes." Dan: All right, good answer. Then my additional tip is if you are lucky enough to be a recipient of one of these, the very first thing that you should do when you respond is you should put the person who sent the original email onto a BCC, a blind carbon copy, because what really stinks is when you're the person introducing someone and then your return gift is a series of 37 emails trying to schedule a meeting that you are not involved in. So, I think it's really polite to write back and say, "Hey, thank you Joey so much for the introduction. I'm going to move you to BCC. Now, Frank, it's really great to meet you. Blah, blah, blah." A lot of them people do that because truth be told, once you make the introduction, you do want to step out and let the two people handle it themselves. The old reply all is pretty popular and sometimes ends up hurting the situation. Joey: I 100% agree with that Dan. Make sure you move the person who was kind enough to do the intros get them out of the thread. So, three key takeaways. You need to always do double opt in. Check with both people before you make the introduction. Next, follow the six step process that we outlined. Check with both parties first, connect them via email, introduce the junior person to the senior person, tell each person a little bit about the other person, include relevant links to their LinkedIn profile and/or their website and then leave it up to them to take the conversation wherever they like. Finally, make introductions. They're a great way to expand your network and deliver value to your network which has a tendency to come back and provide more value to you. There are so many great customer experience articles to read, but who has the time. We summarize them and offer clear takeaways you can implement starting tomorrow. Enjoy this segment of CX Press where we read the articles so you don’t need to. Today's CX Press article is an oldie but a goodie. This is one that's been around for a while but is from the personal blog of a good friend of mine Nir Eyal. Nir refers to his blog as the intersection of psychology, technology and business. The article is entitled " This is Your Brain On Boarding: How to Turn Visitors Into Users". Nir talks about the importance of building the on ramp to using your product or service and how having an on-ramp like this is critical for every industry, because when you do it correctly, the on boarding process can serve as the foundation for creating strong user habits. What's really cool is Nir then goes on to describe a consistent design pattern of trigger, action, reward and investment. This four-step process and pattern and think of it as a loop that kind of feeds back on itself is a great way to get your customers to see working with you and dealing with you as something that is habitual and that they want to do again and again. His fantastic book Hooked gives a bigger discussion about this, but the article breaks down kind of the four elements. So, we're going to walk you through what those are and give you kind of an overview of what this methodology really is. Dan: So, the first part of the pattern is trigger. That is the actuator of the behavior. Habit-forming technologies tend to start by alerting users with external triggers. That can be an email or a website link or the app icon on your phone. By continuously going through these hooks, these triggers, users begin to form associations with internal triggers. Those become attached to existing behaviors and emotions so that internal trigger becomes part of the routine behavior and then the habit is formed. Joey: So, once the trigger starts to be identified at either a conscious or a subconscious level, you then want to move the user to action. You want to get this customer to do something and by reducing the effort involved to do that, it increases the likelihood of the behavior. So, what we mean by that is by the easier you make it to do the action, the more likely it is that that's going to be adopted as an ongoing behavior and habit. Here, simplifying the experience is key. We're all familiar with the acronym KISS, right? Keep it simple stupid and yet so many businesses especially in the technology space are adding layer upon layer onto their products and services so it gets really confusing. I've landed on webpages where I swear and I didn't count but it felt like there were 38 calls to action on the same page. It leaves a new user especially feeling like they don't know what to do next. So, after you trigger the behavior, you then get them to take an action. Dan: If you can get them to take the action, you next want to present a reward, because who doesn't want to be rewarded for taking actions? The article talks about variable schedules of rewards of being a really powerful tool that companies can use to hook users. So, the research shows that there are levels of dopamine that serves when the brain is expecting a reward. When you introduce variability into that, it multiplies the effects. Think of something like the lottery or gambling where the potential reward is always moving. This creates a frenzied state in the brain which activates the parts associated with wanting and desire, things that we want for people to think about with our business. Joey: Want and desire, absolutely. Now that the brain is poised, now that you've gotten … you've triggered the activity, you've gotten them to take action, you've got the rewards lined up, they're feeling good, the brain is flooding with dopamine, now you want to come and this one's a little bit of a surprise I thought with investment. You want to ask the customer to do some work, to put in some effort because all the research shows that exerting effort makes people value the outcome even more. In fact, a study from Harvard calls this the IKEA effect. When we have to go through the adventure, challenge, headache, nightmare, you choose your modifier of putting together a piece of IKEA furniture, the reward of having it all done at the end makes us love that piece of IKEA furniture that oh by the way we built even more than we would've loved a piece of furniture that we just purchased. The study notes that labor loan can be sufficient to induce greater liking for the fruits of one's labor. Dan: Next time I go shopping at IKEA I'm going to send my shelving unit to that guy at Harvard and have him build it. Joey: What I think is what I love about Nir's article and about his kind of methodology here is that this last part is a little counterintuitive, because in the beginning we're like, "Oh okay, we want to trigger them. Then we want them to take action. Then we'll reward the behavior." I think most people at that point would go back to well then we trigger it again and they run the race again and we reward them again, but what he's saying is I love this fourth step of make them work for it a little bit. I was in a conversation not too long ago with the co-founders of a company who were explaining and it was really interesting. It was a dinner party so we had the two co-founders of this company called Belay, B-E-L-A-Y, that's a VA company, fantastic folks, fantastic business, at the dinner table with someone who is a new client of theirs, and so we were having this very open discussion about customer experience. The new client was saying, "I really didn't like how much I had to do in the beginning. Why did I have to spend time on these kickoff calls and why did I have to do all this work?" The co-founders were very polite and very acknowledging of kind of the customer's pain, but they said, "It's actually by design. We want you to have to work at it a little bit, because if you work at it a little bit, you'll actually buy into our process and methodology." Now the secret is not making the customer have to work too much where they become annoyed at the investment they're being asked to make and they turn and run away from doing business with you, but giving them a little bit of pre-work or a little bit of homework to do to kind of get things started. The science shows that that's actually very effective. Dan: Yeah, and that does make sense to me. I was a psychology undergrad major and I love this stuff. I love how the brain works. It's funny when I graduated college I was psychology and communications and I have no idea what I wanted to do. I ended up in marketing which in hindsight is like the perfect combination of psychology and communications. Joey: That's all marketing is. Dan: Yeah, that pretty much is what it is. So, I think this stuff is really, really interesting. It reminds me a lot of Pavlov and all the stuff that we learned in psychology classes at school. Part of the reason why this stuff has survived the time is that it works. It's not surprising that it works in customer experience as well. I think that the investment part is probably the part that I would potentially argue about a little bit, because I do think it depends on the person. There are definitely people that enjoy the working to build the IKEA furniture or I'm having nightmares about a basketball hoop that I had to build last summer that I don't have any idea who wrote those instructions, but it clearly was not somebody that was trying to communicate with me on how to build a basketball net. So, once I lose an entire day doing that, every time I see the darn thing, that nightmare resurfaces. I also get that the more you invest in it, the more you're likely to get out of it. Also, probably the stickier that you're going to be with the company. Another psychological precept is this idea of sunk cost. So, once you've sunk that time into the investment, you're probably more likely to stay because you've got inertia going with you anyway. Joey: Exactly. We may not agree folks with how the brain works but it does work in very specific ways. We may not like it. We may not personally enjoy experiencing what it's like to build the basketball hoop, but all the research shows that there actually is a higher affinity for the product if we've had to work for it a little bit or for the service if we've had to work for it a little bit. I think the secret is how much is a little bit. So, the three key takeaways from this CX Press. Number one, checkout Nir Eyal's book Hooked, H-O-O-K-E-D.
Great, quick read that really dives deeper into his philosophy and methodology. Number two, keep the four-step hook model in mind when you're designing your customer experiences. You're going to need a trigger. You're then going to need an action. Following the action, you want to give the customer a reward that includes a little bit of investment on their part that leads them back to the trigger. Last but not least, always be iterating. Your customers are evolving. You should be evolving too. If you do it effectively, hopefully your customers will become hooked on you. Sometimes a remarkable experience deserves deeper investigation. We dive into the nitty-gritty of customer interactions and dissect how and why they happen. Join us while we're dissecting the experience. Dan: Did you say friction? Joey: I did. Friction, yeah. This is a very … Robbie is a contrarian guy. So, he reached out and he was like, "Look, I know you talk a lot about making it easier, efficiency. I have this idea around friction and here's an example I want to share." We talked about it and I realized that he's right. This actually ties into our previous segment where we're talking about Nir Eyal's book and how you want the customer to put in a little bit of an investment to get them bought in. So, here's what happened. Robbie was looking to hire a virtual assistant or a VA. He signed up for a firm online and to sign up online for this virtual assistant or VA firm, he entered his name, his phone number and his email address and then it went to go to next step. When he went to the next step, it said you're almost done. Now activate your $25 free credit to send in your first task for the VA to do if you complete the task in the next five minutes and 15 seconds. Now what I loved about this is it immediately forced the customer, the new customer, to have to do something but it intrigued them. It said, "Hey, you're signed up, but if you want a $25 free credit, all you have to do is tell us a little bit about your first task and you'll be off to the races." Dan: Yeah, I think this is pretty interesting. The free credit to me and certainly the time associated with it strikes me a little bit more as sort of an intended sense of urgency and that in order to drive a faster response, but this idea of the friction here in terms of filling out the form, to me it's a little bit like a site asking for an email address in order to download a white paper or sites requesting a credit card number even though it's a free trial for the first 30 or 60 days. I think that the reasoning for it is that you do create a little bit of this inertia that kind of gets you going already. It's really hard to do that without creating any work for the person that is trying to sign up. 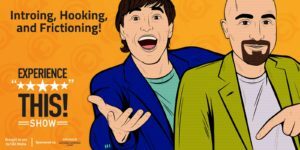 Joey: I agree but where I think this virtual assistant company took it one step further is by driving you to submit your first task at sign up. I don't know about you Dan, I've worked with a number of virtual assistants over the years. There've been some programs that I've signed on to and then I haven't actually gotten up and running with the virtual assistant for weeks or even months. What I love about this model is that you've already kind of become a customer. You signed up but they … for lack of a better way of putting it, force you using your own psychology to submit your first task because you don't want to miss out on that free credit. Robbie goes on to talk about different things you can do in other areas of your business to create these little friction points. So, for example, with new job applicants, one way to test and see how effective they're going to be as employees is to have them do something that's above and beyond submitting their resume. Maybe have them make a video about why they're a good candidate or put some specific information into a form about themselves so that they have to present their background and their work in a different way than they're used to. These little friction points that are designed to really see if they're bought in and if they're willing to figure it out without directions. I like to think of all these things as baby steps or micro accomplishments, what are the little things you can get them to do so that they will do the big things that you want them to do. So, I think we have three key takeaways here. Number one, friction can be good. It can serve a higher goal. Number two, create these little micro commitments and mini victories that allow your new customers to feel even more bought in to your product or service faster and number three, don't be afraid to own your friction. Everything doesn't have to be a walk in the park and if you give just enough friction, the research and the psychology and the brain science shows us that it will actually make this new customer love you even more. 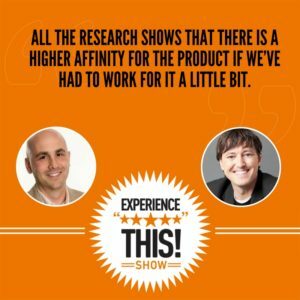 Listen in while we try to stump and surprise each other with the fantastic statistic from the world's of customer experience and customer service. It's to time to check out this number. This week's number is 55%. What do you think it refers to Dan? Dan: I'm going to go with the historical average of the groundhog seeing his shadow. Joey: 55% of the time the groundhog sees the shadow, I like it. Well actually that may be true but this 55% refers to the percentage of CX professionals who believe their company will face disruption from more nimble competitors. This is based on a survey conducted by our friends at Oracle and shared by our friend Samantha Hausler, a marketing strategist for Oracle CX. Joey: Do like that little lawyer insult there folks? That was nice. It's subtle. Dan: They're not nimble. So, this should be a fear this disruption especially in industries that have yet to be disrupted. There are plenty of those. We always list the ones like the Ubers and the Airbnb's that have completely disrupted industries, but there's plenty more that have not yet faced that disruption and it's coming people. Joey: There is not an industry on the planet that isn't going to be dramatically disrupted in the next 10 years. Yeah, if you think you're safe, you probably aren’t paying attention to other things too. You can learn more interesting statistics like this one from our friends at Oracle Smarter CX who by the way have a fantastic new CX assessment tool. So, this tool allows you in like two minutes or so to answer a few questions and see how your organization stacks up in the world of CX. You can find it at oracle.com/cxperformance. Thanks as always to our incredible friends at Oracle for sponsoring the show. You make Experience This! possible and we can't thank you enough.